I love brunch, so I was delighted to start and finish my Thanksgiving week by sharing brunch with family and friends on both sides of the Atlantic. The London brunch scene is thriving, with reservations a must for many of the best restaurants; gone are the overdone eggs and in are lively innovations both within the menu and customers. Most are offering bottomless mimosa cocktails, but at one up-scale restaurant they have a special “Dine with your Dog Brunch” including the ‘six legs’ menu, complete with a two-course brunch for both you are your dog. Here in Laguna, less overtly canine innovation is on the menu as restaurants compete for the increasingly large local audience of families and friends wanting to enjoy great food and maybe a ‘hair of the dog’ or two. The new brunch menu at the Loft at the Montage, provides the perfect reason to visit this iconic hotel. The Loft itself has a hotel-restaurant-room feel to it, so while it commands a beautiful position overlooking the Pacific, I would ask for a balcony table where you can soak up the sea view and enjoy summer year-round. Needing a hair of the dog the day after his 50th birthday party, my husband enjoyed his blood orange mimosa with just a hint of Elderflower liqueur, reminding him of British hedgerows where it grows wild. We also tried the Bloody Mary, adorned with delicious garnish of a bacon wrapped fig. Yum. If you are looking for a healthier option, choose from a range of cold pressed juices with promises to rejuvenate, detoxify, restore or even heal. A range of egg-based dishes on The Loft brunch menu. A good brunch menu should create the right balance between breakfast and lunch; The Loft’s works well. The menu is in two parts, “To Begin” focuses on slightly lighter dishes, including a wonderful seafood cocktail with oysters, shrimp and lobster and an intriguing avocado toast with hard-cooked egg, cherry tomatoes and arugula, or if you are feeling indulgent go for the “pan breads” including the must-try, deliciously thin crepe oozing with apple, mascarpone and vanilla and bourbon caramel, topped off with crunchy candied pecans. The second part is dominated by the main “Weekend Brunch Menu” with influences from around the globe and is a testament to how many appearances an egg can make on one menu. The answer is nearly every dish, but you can request them egg-free. Try the Spanish frittata, made with Spanish manchego, which pairs particularly well with the generously served smoked paprika crema. For a flavor of New York hit the pastrami hash. The pastrami and potatoes happily kept some of their crunch and were cleverly flavored with horseradish and chili, before being topped off with two perfectly cooked sunnyside eggs and the sweetness of caramelized onion. For me, though, the tastiest dish was the chile verde made with slow cooked shoulder of pork, brimming with spices and a real depth of flavor. 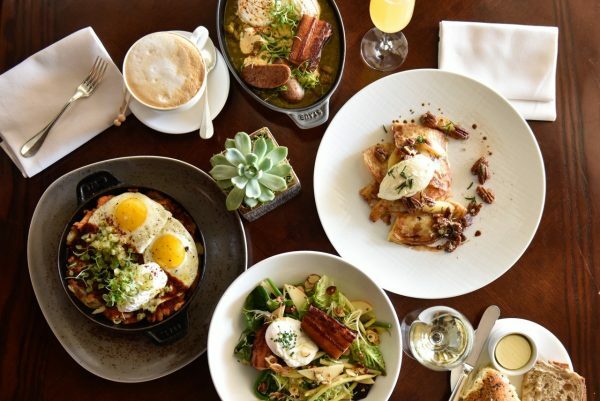 If brunch is a time for conversations, then The Loft will give you lots to talk about and none more so than the flavors bursting from every dish.